After one week of juicing and two weeks of eating raw, I seem to have found a system that works long-term. During the raw weeks, I discovered just how much I genuinely loved eating and preparing raw food at home, so I’ve stuck with it. This, however, did not stop me on Sunday, when I sunk my teeth into some of the world’s finest BBQ. Since embarking on this food reboot almost a month ago, I have noticed some major changes. For instance, I can hardly drink anymore, because I’m hyper-aware of the exact effects of alcohol on my liver, energy, and mood. This makes the occasional drink even more of a decadent experience. One cup of white tea has me bouncing off the walls now. Eating heavy stuff like red meat has to be in moderation, too. In short, I’m becoming a lot more in tune with my body, and enjoying it immensely. I’ve been having this almost every day. 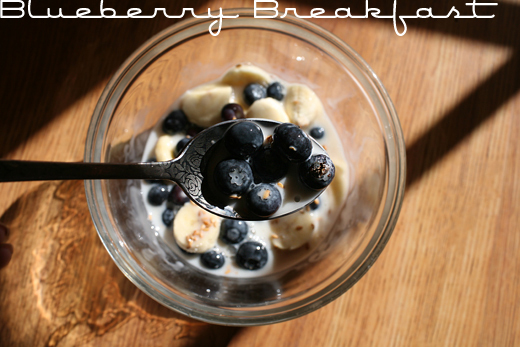 Just slice a banana and throw it in a bowl with fresh blueberries, a pinch of flax seeds and some almond milk. To die for, every time. The photo lies! 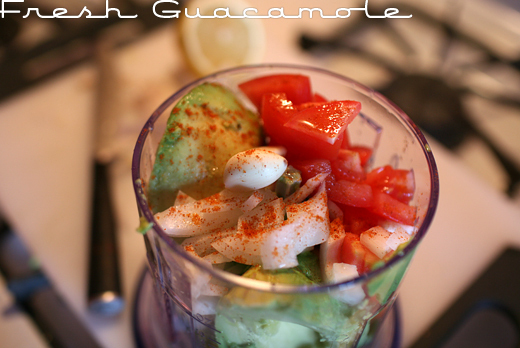 You don’t actually want to put avocados into the food processor. Technically, you could, but the consistency will be super-smooth. I prefer my guacamole chunky! If you do, too, blend everything besides avocados into small chunks, then add to a large bowl of half-squashed avocados and mash together. Great on carrots, peeled cucumber wedges, or these. Combine ginger, sesame oil, chili oil and olive oil in a food processor, then blend. This is your dressing. 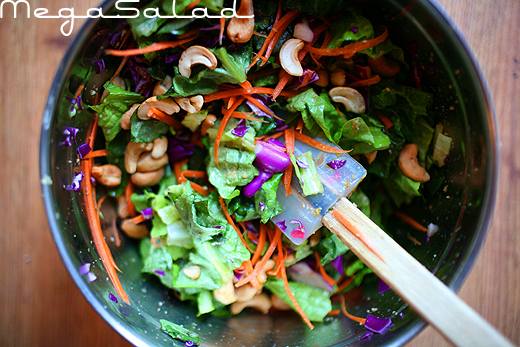 Chop the lettuce and cabbage, shave the carrot, combine in a bowl with cashews and cranberries, then toss with the dressing. Ta-da! This salad is delicious, crunchy, and filling. These wraps are, basically, this recipe, but I’ll copy + paste it here for you, with a few of my own changes. The only real difference is that I used lettuce to wrap instead of spinach leaves, and skipped the hemp seed and sea salt because the soy sauce was salty enough. In a high-speed blender, puree the honey, lemon juice, ginger, red chili, and soy sauce. Add the almond butter and blend at low speed to combine. In a bowl, mix the almond butter dressing with the cabbage. The best and easiest way is to do this with you hands or a large wooden spoon. 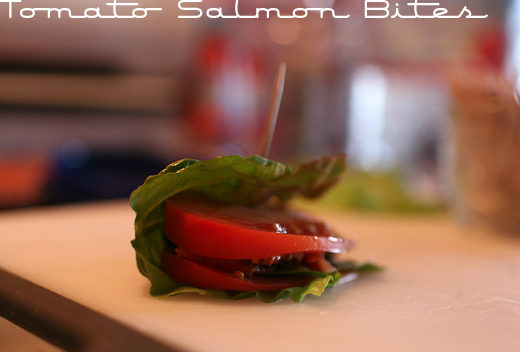 Place the lettuce leaf on a cutting board with the underside facing up. Then, put some of the cabbage mix on the leaf. 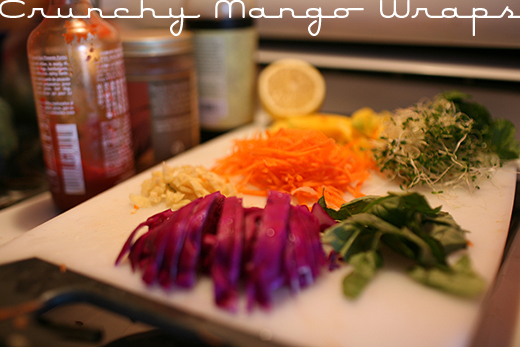 Add a few shavings of carrot, some sprouts, a few pieces of mango, a few leaves of cilantro and basil. Roll up or fold the lettuce leaf – you might need a cocktail stick for it to hold. Personally, I don’t let it get that far, because this recipe is actually ideal for preparing as you eat, which helps to gauge how full you’re actually getting. Ales and I even took all the separate, prepared ingredients with us on a picnic last week, and made these wraps by the ocean. Mmmf! This looks amazingly delish. I am totally inspired by by all of your raw foodie posts. I think I will jump on this smoothie/raw train. Which is perfect cause i have a ton of fruit right now. so awesome! i love the recipes you post. looking forward to trying some very, very soon. yum! so funny you should post this now as after my detox last week I’ve been totally looking up more raw recipies to add into my normal diet it’s amazing how good your body feels from eating more raw foods, I even bought some raw honey this week which has to be the best honey I’ve ever tasted! great recipes! you might enjoy the typical Mediterranean salad dressing …i can eat endless quantities of salad with it. it’s simple but delicious: using a mortar & pestle, grind up garlic. add extra virgin olive oil, 1/2 lemon, freshly squeezed, salt & pepper, then mix. adjust quantities to your preference. chopped parsley can also be added. we use it for a tomato, sliced celery & fresh artichoke hearts salad too. just learn to cut artichokes properly if you do it yourself! get a nice fresh whole wheat baguette for the side & also to sop up any leftover dressing, ha! I love that you’ve gone raw! I’m also mainly raw, with the exception of proteins like eggs and lean meat. I mainly went raw though because my body just simply can’t handle most things people eat everyday. I can’t have gluten or lactose, red meat, soy and especially not seafood. One shrimp, or simply one slice of fish will make me dangerously sick. So whenever I see raw recipes I get really really excited! Mainly because I know that I’ll most likely be able to eat it. So I can’t wait to see more of these recipes! Congratulations! Going raw for two weeks is quite a feat. I know because as of yesterday I just finished an herbal detox and ate only raw for 13 days. Lost 3 kilos and cleared up a minor health issue. Also not keen to start drinking anytime soon! A fantastic dressing that got me through many a salad is lime juice+olive oil. Super simple yet supremely delicious! 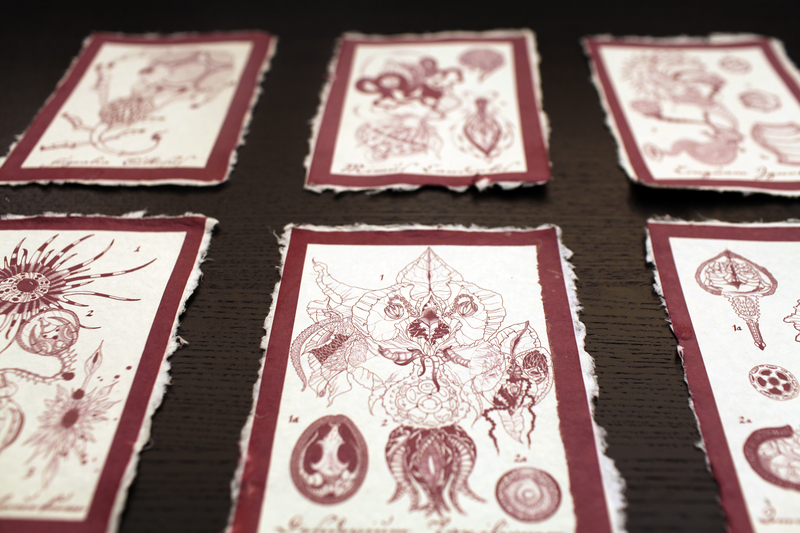 There is no field of human knowledge or endeavor that Zoetica Ebb will not master. If a body is a vessel to be maintained for some sort of unfathomable stuff, this diet seems optimal for that. Tried the blueberry breakfast in the afternoon to power up my batteries. What can I say? thank you for constantly inspiring me. Maggie, I’m having that RIGHT NOW! By now I’ve tried everything except the Mango Wraps and it’s so freaking good, all of it. Thank you! Huzzah! I am pleased to bring nomz to my peeps. My husband demands that guacamole weekly now. What have I done?! YOU CREATED A MONSTER. A green mushy monster. Keep the nomz coming.